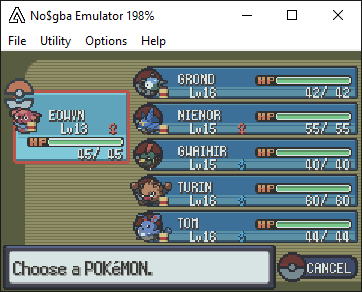 After beating the gym, I healed my Pokemon and then went to go deal with the Team Aqua grunt again, although this time he had a Solrock instead of a Celebi. Regardless, Turin was able to quickly deal with it so I left the cave and cleared out the spot outside of the cave with the double battles. One of the items that was there was a Lucky Egg, which I gave to Turin who'd fallen behind a bit in levels. I then headed back to Rustboro to deal with plot things and fight May. 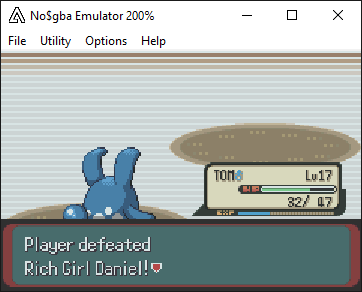 I momentarily forgot that Tom was a Ghost type and sent him in to fight May's Milotic, but it wasn't a serious problem. After healing up, I went to get the items in Petalburg woods that require Cut and then headed off to Dewford Town. Immediately after arriving in Town I talked to the fisherman and actually got my Old Rod this time. Fishing in Dewford town I was able to catch a Delcatty which I named Lobelia. Huh. Air Lock may be useful considering how much the weather causing abilities seem to have been spread around, but I am really confused about that Frenzy Plant, considering that it's both a very powerful move and its out of type. 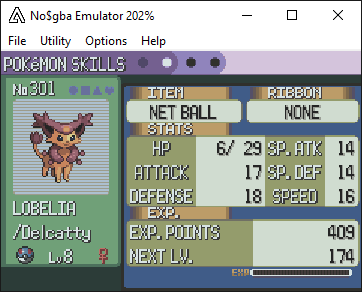 I gave Lobelia the Lucky Egg and went up to Route 106 to beat the trainers there and then went into Granite Cave for my next capture. 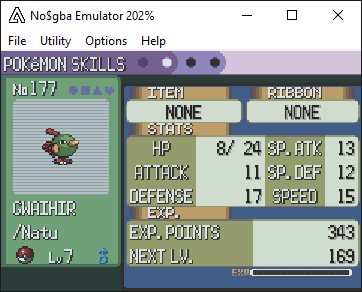 It turned out to be a Natu that I named Gwaihir. When I don't know the type of most Pokemon, Lightning Rod isn't as useful as it could be, but overall decent ability and moves. 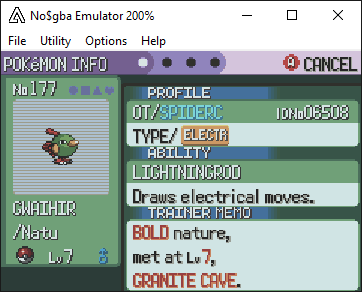 I finally got a full team of 6 Pokemon, but I wasn't a huge fan of having three Ice types so I went back to Route 106 to do some more fishing and see what I could get. Unfortunately, it was a Jirachi with Truant. I considered not wasting the Pokeballs trying to catch it, which apparently would have been the right call since the stupid thing used Roar on me after I wasted about 10 of them. I headed back to Petalburg to restock on Pokeballs then went to Route 107 to try fishing again. 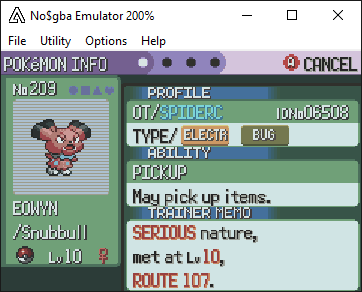 This time it went significantly better and I was able to catch a Snubbull which I named Eowyn. I'm guessing the Pickup table didn't get randomized, but it would be hilarious if it did. At any rate, I decided to bench Lobelia since her types were well-covered elsewhere on the team. I then spent some time grinding in Granite Cave to get some levels on the two new members. At level 10, Gwaihir learned Thunder Punch, dropping Spark. As usual I went through Granite Cave before challenging the gym and got TM Teeter Dance from Steven. Thanks, but I'll pass... After leaving the cave I healed up and decided to start my gym challenge. I learned from the first gym that all of the Pokemon still shared a type so I was immediately looking for a pattern. Unfortunately, the first gym Pokemon I fought was a Dewgong which I had already fought in Granite Cave and had discovered that it was at least part Dragon type, which didn't bode well. However, the next two Pokemon I fought were Smeargle and Furret and I was able to confirm that they weren't Dragon, although I wasn't sure what they were apart from Furret looking like Poison. To make matters worse, the next Pokemon I fought was a Dark Metang and I confirmed that Poison wasn't its secondary type. Meanwhile Nienor learned Mist Ball at lv 16, dropping Agility. The second to last gym Pokemon I fought before Brawley was a Tauros that I was moderately sure was Flying/Normal so I decided to just call it a Normal gym as I didn't have any Fighting or Ghost moves to confirm. Last was a Lickitung, which I had apparently already established a Normal type so I was able to confirm the gym's typing although it didn't help me much without having any Fighting moves. 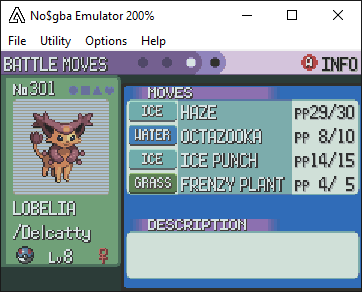 Turin easily took out Brawley's Tauros, but was almost KO'd in return after a Brick Break from his Relicanth. Nienor then answered and defeated the Relicanth, but was almost KO'd himself by a Singal Beam from Brawley's Shuckle. As it turned out, the Shuckle's secondary type was Steel, but if it had been Bug then Nienor would have dropped to the extra STAB damage. This time I actually got a decent reward with TM Ancient Power. Nice going getting everyone through the second gym! 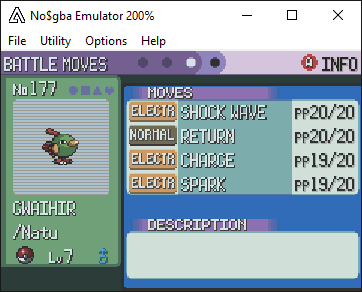 It's interesting that you had a monotyped gym because @JacenBoy didn't in his Emerald, though he did in his previous FireRed runthrough. How odd! Hey how's this going? Are you going to continue this any time soon? It looked like you were having such a fun adventure. Sorry about your starter though.